This ring is inspired by the bird nest ring which i still have no idea how its made. Instead, i played around with the wire a bit but only managed to come up with this simple ring. 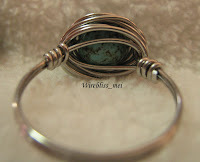 Basically, i coiled the wire round and round the stone a few times and wrap around the shank to secure. I am quite happy with the outcome though, as it looks clean and simple on my finger compared to the twice around the world ring i made earlier. Am wearing it now. great ring and it is a birds nest ring.